I'm really happy with the plug-in finally I can use FIRECODER card with EDIUS. To finally get rid of two steps to first encode to avi and then through FIRECODER encode the file to m2ts file. It is a huge time saver. Canopus has abandoned us FIRECODER owners for some strange reason. Next upgrade will I really be sure if FIRECODER supported or I will definitively not upgrade. Last edited by sitosson; 12-09-2012 at 05:06 PM. I have not tried this but AFAIK it is not for FireCoder (or Spurs Engine), it is just software Mpeg 2. If it was able to use Spurs Engine it would list this as a feature from within EDIUS 6.5. Support fast encoding through SpursEngine enabled devices! The TMPGEnc Movie Plug-in MPEG-2 for EDIUS can use the hardware encoder implemented in the Thomson Canopus FIRECODER Blu or Leadtek transcoding cards to dramatically accelerate the MPEG-2 output (especially for high-definition content) compared to the standard CPU encode. 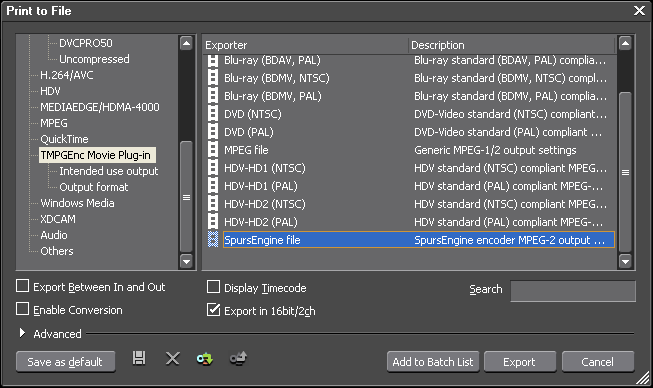 *This plug-in only accesses the MPEG-2 output function of SpursEngine devices. While it isn't that much of a benefit only having Mpeg 2, I agree with the poster, it is a third party showing up GV. Still has black bars and no filters. My Firecoder is in its box on the shelf. My PC is much faster for Bluray encode straight from the timeline in Edius and one needs to use the full version of TMPGenc to get a good encode without black bars in the encode. 2 pass VBR MPEG2 from within Edius would solve my problems. Still think a HQ export and let TMPGenc full version with the Spurs Engine Plugin for Bluray and software for MPEG2 VBR 2pass is a better choice in my opinion this will do a proper encode in batch mode . Maybe a little longer but I think a better encode. This is a 2 pass MPEG-2 encode with out black bars. 1920x1080. While I would rather have the full control of TMPGE 5, this appears to give some functionality to FCB cards. It is cheaper to build a encoding box than to purchase an FCB. The black bars are on the downconverted encode to MPEG2 for SD DVD not a 1920x1080 MPEG2HD encode. I have the trial on my second system running Edius 5.5 but I assume it is the same on all the versions. Just did one again and the black bars are there on the downconverted encode. It will be interesting if FCB does it different. The black bars is an Edius issue and not the Mpeg plugin. You have two choices. make sure the framing is good for you. The layouter method is better and you don't zoom as much. Last edited by Jerry; 12-10-2012 at 04:12 AM. With either of these approaches Edius is doing the scaling removing the problem that the plugin has, that the full version does not. Also if one is using an Edius version before the improvements in the layouter then the scaling will also be poor. Quality scaling is the key to a good downconversion.